Another interesting vermouth cocktail, with two very different recipes here. Aside from the different spirits used, the emphasis, or lack thereof, is pretty marked between the two. The combo of apple brandy and gin doesn’t sound terribly appealing to me on paper, so I’m curious how that one will come out. 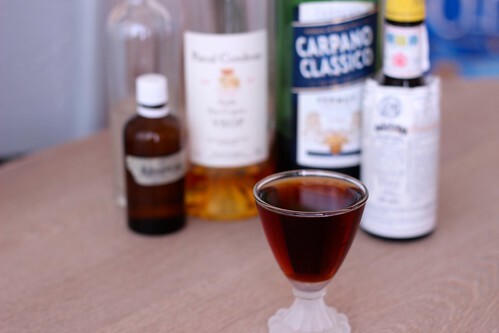 The modern recipe uses apple brandy and vermouth, with some dashes of bitters and simple syrup, which sounds like a better combination than the gin. As written, the Lommebogen recipe is something for which I can imagine the end product better, and ends up being closer to the modern version of this one. The Lommebogen version is nice, though perhaps a little sweet. The bitters and the absinthe help sharpen that up though, so it’s quite drinkable. The Savoy/Café Royal version is simple gross. As I suspected, this is just a big shot of liquor, and I don’t find that the gin and calvados go very well together for me. I couldn’t drink it.